Welcome to the Good Life! 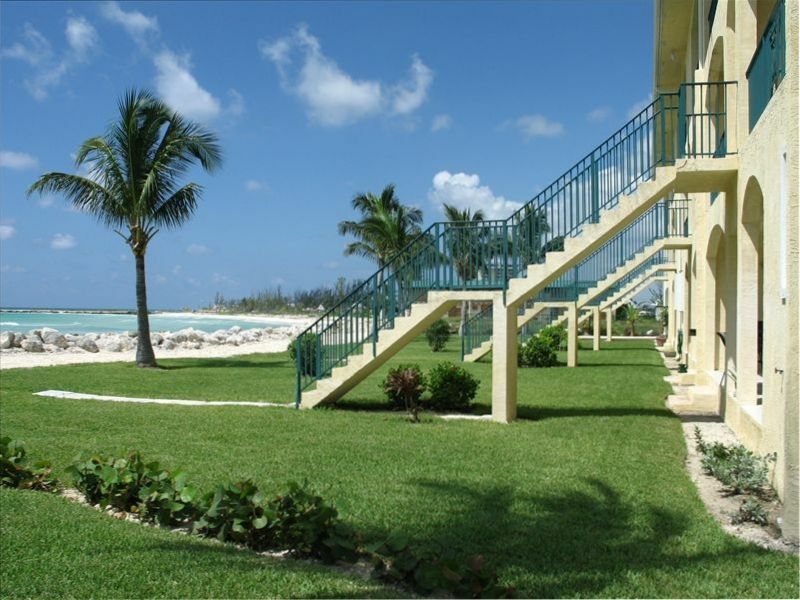 Enjoy the gentle sounds of tropical breezes and beaches in this very spacious 3 Bedroom, 3 Bath ocean front garden unit on the southern coast of Grand Bahama Island in Freeport. Located in the exclusive gated community of Port of Call, this is the perfect place for your vacation Getaway! Amenities galore are found in this fully furnished 2600+ sq ft ground floor condo! Hi Def 65” TV with Cable, Internet Access, telephone, propane gas grill, central air conditioning are just some of the luxuries awaiting you. The ocean, beach and pool are just steps away from your door. This is an open floor plan with plenty of room everywhere. The 10-foot tray ceilings throughout the unit enhance the spaciousness. Twelve-foot wide glass sliding doors in the living room and the ocean side master bedroom offer great views and easy access to the patio. The ocean front patio is a great place to watch the sun rise or set. WiFi available in the unit. We had a great vacation! Absolutely loved this island. The condo was very large and had plenty of room for our 3 couples. Some things could use updating but the price is right. Property was on a beautiful beach, accommodations were nice. We had a great time the owners were helpful with our questions and needs. Port Lucaya was a beautiful place with great food and shopping. Had a great snorkeling adventure and the people of Freeport were so friendly. On our beach we saw stingray, and found many sand dollars and shells and were able to snorkel right on our beach. The water is just beautiful. Thanks Sue and Fred we made great memories with our family and grandkids! We enjoyed 8 nights in this wonderful condo. Perfect location- had the beach all to ourselves but just a few minutes drive to shopping and Port Lucaya. The owners were awesome, responding very quickly and working with us to accommodate our schedule. We came in on the Baleria ferry from Ft Lauderdale so our timing was very rigid. The home is quite large. All the rooms are over sized with comfortable beds and having 3 baths was a plus! The kitchen - dining- living areas were perfect with their open concept. The home is very well stocked with lots of water toys and the view off the patio and the beach just steps away were amazing. I would definitely recommend this beautiful home! Thank you so much for your wonderful words! We try to treat our guests as we would like to be treated, and it’s always encouraging to hear that we’re doing a good job! Great location, large condo, loved the idea of 3 bathrooms since we had a group of 5 ladies. We went with our 4 children ages 13-20 and we had more than enough space. It is 10 minutes from Port Lacaya and we are so glad we stayed here and not in the 'touristy' area. The snorkeling was fabulous right outside the backyard. We went to Grand Bahama Scuba to become certified divers and would highly recommend them for diving. Fred and Sue gave detailed and accurate information to make your way around town. The beds were very comfortable. I would recommend this place to everyone traveling to the area. We made such memories in the comfort of a home. My family and I spent spring break that this condo in April 2016. We had 6 adults and 2 children and the condo size was perfect for this group size. The rooms are spacious and comfortable. We went to the beach everyday and it is accessible by a short walk, 75 yards, and is beautiful white sand. The sand is soft and the water is shallow at low tide so its the perfect place for little ones. The beach was uncrowded and clean. The location is a bit of a drive from restaurants and grocery stores/shopping so we rented a car. A fast food place or two could be reached in a 5 minutes drive with better sit down style restaurants approximately a 15 minute drive. There are several good places to each and shop and we never ran into traffic so the rental car paid dividends. It was very nice to go and shop and eat and yet come back to a place with solitude. Susan also had very good recommendations as for places to eat and we also went on a fishing trip with Captain Les and had a great time. A very enjoyable trip. Relax by the beach that’s just steps away, or soak up the sun next to the pool. Feeling adventuresome? Snorkel the reefs just outside your door, or visit Port Lucaya for shopping, restaurants and great Bahamian excursions. There are plenty of activities: diving, fishing, snorkeling, swimming with the dolphins, nature kayaking at Grand Bahama National Park, horseback riding and parasailing. These are all within easy reach by car!